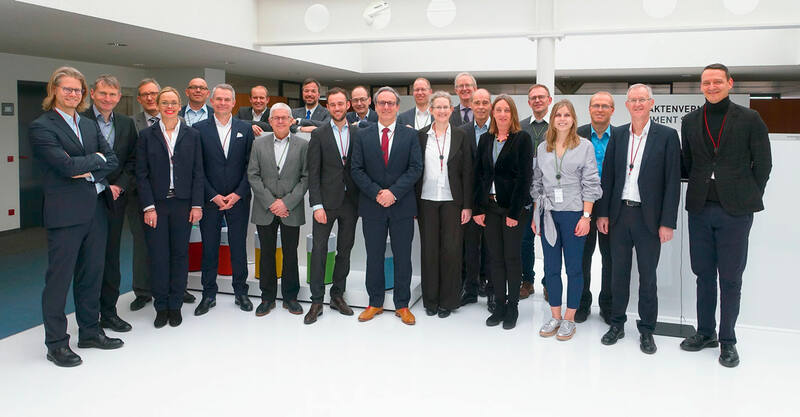 The Foreign Trade Committee of the Reutlingen Chamber of Industry and Commerce meets regularly to share their experiences and opinions on current foreign trade and economic policy topics. We are also a member of this committee. At the invitation of K+P Export Management, the latest meeting was held at our premises. Numerous representatives from international companies in the region were able to get an extensive insight into our wide-ranging activities as part of a company presentation and tour. For support, the plenary of the Reutlingen Chamber of Industry and Commerce has set up various committees with an advisory role, one of which is the Foreign Trade Committee. This is comprised of representatives from companies in various sectors with a strong focus on foreign trade. The committee currently has 37 members, including executive boards, managing directors and sales directors from renowned, international companies in the Chamber of Industry and Commerce's region. The term of office for the members selected by the Chamber of Industry and Commerce plenary is five years. The members of the Reutlingen Chamber of Industry and Commerce Foreign Trade Committee are the first points of contact of the international business division for matters relating to regional or nationwide opinion polls or polls on the state of affairs.